Before the development of pulse oximeters, in the not-so-distant past, physicians primarily had to assess, diagnosis, and evaluate many medical conditions based on their experience and clinical judgment. This is an essential part of diagnosis, but some symptoms manifest only at the later stages of the disease, especially with problems concerning respiration. When breathing is weakened, arterial blood oxygen levels are reduced. Oxygen deprivation is dangerous and puts patients at risk. Fortunately, with the advancement of medical technology, high-quality innovations in the medical field have allowed doctors to diagnose and treat diseases more successfully. As a case in point, the development of the pulse oximeter has decreased the time in detecting oxygen desaturation and has also greatly minimized unnecessary blood testing. There are many occasions on which a person can be deprived of oxygen. Hypoxemia, where there is a low amount of oxygen in the blood, may be brought about by illness or trauma to breathing structures. People who have respiratory disorders have the greatest chances of developing decreased arterial oxygen saturation. The principal candidates are patients with asthma and chronic obstructive pulmonary disease, and to a lesser extent, cardiac patients. Blood disorders that cause a deficiency in hemoglobin or alter the capacity of hemoglobin to carry and transport oxygen also result into decreased oxygen saturation levels. The purpose of a pulse oximeter is to read the current amount of oxygen present in blood by placing the sensor over the fingertip (or sometimes the earlobe). The pulse oximeter reading will indicate whether activity needs to be stopped, or if supplemental oxygen is needed. Parents of children who have asthma are often advised to have a pulse oximeter with them, especially during strenuous activity. If the pulse oximeter results are read as low, then the child must stop playing, and take necessary medications. For the elderly population, a pulse oximeter is also an important item. 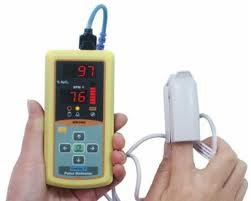 Heart disease leading to oxygen deficiency is a common cause of mortality among the geriatric population, so the pulse oximeter has become standard equipment in nursing homes. The hand-held pulse oximeter has proven to be useful in getting a non-invasive, yet accurate and continuous reading. If delayed, oxygen deficiency causes brain damage, and can affect other vital organs. This is why airway and breathing is a priority during resuscitation, and a pulse oximeter is always present in ambulances, emergency rooms, operating rooms, or any health care facility. Pulse oximeters are also available for home use.